PUTRAJAYA, 22 Apr 2014 – A National Centre for Autism is to be set up by next May as part of the government’s commitment to provide an inclusive education to all Malaysian children regardless of their disabilities. Prime Minister Datuk Seri Najib Tun Razak said another initiative to help autistic children is to turn the Permata Kurnia project into a national centre of excellence for autism. 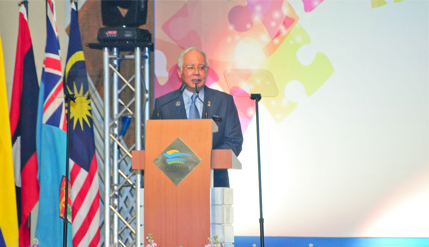 Opening an International Seminar on Autism 2014 in Putrajaya co-organised by The National University of Malaysia (UKM) and Autism Speaks today, he said the setting up of the National Centre for Autism is aimed at nipping the problem in the bud. The two-day seminar was attended by over 1,000 local and foreign participants. The prime minister’s wife, Datin Seri Rosmah Mansor is patron of the seminar. “In light of the phenomenal rise of autism globally, countries are reacting to it proactively with prescriptive national action plans on how to set up a comprehensive early intervention system, supporting and empowering families and ensuring sufficient supply of effective professionals in the field,” Najib said. Autism is a collective term for brain development disorders characterised by difficulties in social interaction, problems in verbal and non-verbal communication and repetitive behaviours. Datuk Seri Najib said under PERMATA Kurnia, about 300 autistic children aged between 2 to 6 years old would be able to receive early intervention and special education. The PERMATA Kurnia is the first project for children with disabilities to be fully funded by the government. Every five-year old autistic child will be required to enrol in a registered preschool where the teachers must at least have a minimum diploma qualification,” he said. It will be the first project where a multi-disciplinary team consisting of early educators, speech therapists and occupational therapists will work together to provide holistic care to autistic children. The project will serve as a benchmark in implementing autism service-provision best practices which is hoped to be a model for future centres. Among those present at the launch were Deputy Prime Minister and Education Minister Tan Sri Muhyiddin Yassin, UKM Vice-Chancellor Professor Dato’ Dr Noor Azlan Ghazali, Education Faculty Dean Prof Lilia Halim and Dean of the Faculty of Health Sciences Prof Dr Siti Zamratol-Mai Sarah Mukhari.